Islander columnist Becky Fox Marshall explores the pleasures and pain of snow days on Bainbridge. What is it about snow that makes us shop like it’s the end of the world? What is about snow that makes us want it so badly, then detest it so completely? The snow that defined this Christmas season revealed two significant things about myself (and I bet I’m not alone) – when it’s not falling, I feel cheated and when it is falling, I’m freaked out. Bottom line: I’m never quite satisfied. Two of the Northwest’s declining icons are the focus of upcoming public events on Bainbridge Island. On Saturday and Sunday, actor Peter Donaldson (in photo, above) will present Salmonpeople, a one-man show about Northwest history’s links to salmon. The performance will help the Bainbridge chapter of Trout Unlimited raise local matching funds for grants supporting fish habitat restoration projects. Former Bainbridge resident Mike Hale is following a long tradition of talented beer-brewing islanders who live their brewery dreams off-island. Hale, one of the pioneers in the microbrew movement, recently announced plans to establish a brewpub in Poulsbo sometime this year. Read all about it in North Kitsap reporter Derek Sheppard’s story, here. The brewpub will likely employ 40 people and draw some of the clientele that crowd into Silverdale’s Silvercity Brewery. Hale established his Hales Ales in 1983 and operates a brewpub in Frelard. He was brewing his first batches at the same time as former islander Will Kemper, who started Thomas Kemper brewery on Bainbridge in 1984, but quickly moved the operation to Poulsbo. Eventually, the Thomas Kemper company was sold and split into a soda company, which still bears the Thomas Kemper name, and a beer operation that was later folded into the Pyramid brewing company of Seattle. Will Kemper recently decided to open a brewpub, but not on Bainbridge. Instead, he chose Bellingham, where his Chuckanut Brewery & Kitchen offers six site-brewed beers and an upscale ethnic-fusiony food menu. Seems like that would have gone over quite well on Bainbridge, where islanders pack the local pub and generally spend a fair amount of money on good food and drink. Enter Travis Guterson, an upstart brewer who’s trained under some of the county’s best beer-makers. 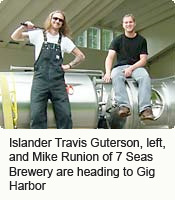 Raised on Bainbridge, and still a resident, Guterson will later this year haul his collection of industrial vats down to Gig Harbor to open 7 Seas Brewery. He tried to find a spot on Bainbridge, but Gig Harbor proved the right fit. Ah, to think what could have been…. Gov. Chris Gregoire’s cost-cutting plan to close Fay Bainbridge and Fort Ward state parks came as a surprise to many island residents and public officials. It also raised some big questions: Will the land be sold to developers? What about the planned sewer system connecting to Point Monroe? Is the Bainbridge park district or city or even the county willing to absorb and manage the large waterfront parks? Why does Bainbridge have to suffer the loss of two of the 13 parks slated for closure? For now, there’s more questions than answers.